The Travis CI Blog: Introducing Travis, Our New Mascot! 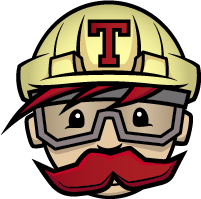 Thanks to the awesome people at Sticker Mule, we can now introduce you to Travis himself, the mustasche behind every one of your builds! The first incarnation of Travis was not a standalone tool or service, in fact Travis was first meant to work together with Integrity, another CI tool, and a RubyGem called Bob, which was a builder for Integrity. In fact, if you visit the link to the Bob RubyGem page you will see the description “Bob the Builder will build your code”. I don’t know if you watch a lot of children’s shows, but at Travis we love children’s TV shows, and Sven is probably the biggest fan of them. In fact when Sven was thinking of a good name for Travis he was watching lots of cartoons, especially one in particular, Bob The Builder. On the show there is a character named Travis, a tractor, who helps out the crew when they need it. As Travis was initially built to work with Bob the builder (the RubyGem), the name seemed fitting. Although Travis CI doesn’t use Integrity or Bob (the builder), Travis is his own man, doing his own thing, making it on his own, and boy he is awesome at it! The awesomeness which is ‘Travis’ has only been made possible by the amazing help from Sticker Mule, especially David. David has been amazing, creating several mock-ups for us, taking all our feedback and then iterating and improving and creating more awesome each and every time. They have even been so awesome to provide us with a huge stack of stickers so we can give them out at conferences and whenever we see a Travis fan! David is the head-designer-extraordinaire at Sticker Mule, you can follow them on Twitter, or see some of the great stuff they create on Dribble. We can’t gush enough about the quality of the Sticker Mule stickers, and it only makes it more amazing that the guys behind Sticker Mule are awesome. They sponsored us with stickers and design help since our early days, and were a tremendous help when we needed some stickers for our crowd funding campaign. The DevSwag Travis Sticker Pack! BUT THAT’S NOT ALL!!! Grabbing your very own Travis sticker is possible right now! Thanks to DevSwag we have a Travis sticker pack ready to ship today! We <3 you Sticker Mule!